Olaf's Frozen Adventure is the animated short film that played before Coco, having been removed from future Coco screenings on December 8. 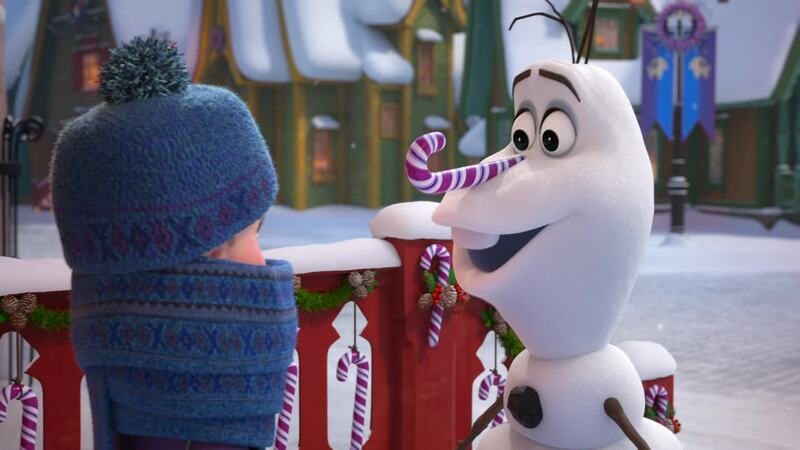 The Disney Company reportedly always had Olaf's Frozen Adventure as being on a 'limited' run. It was just mere coincidence that so many people complained about Olaf's Frozen Adventure before it was pulled. Many stories emerged that Coco audiences were confused, thinking they had gone into the wrong theater showing a feature-length film called Olaf's Frozen Adventure rather than Coco. Many complaints involved the length of Olaf's Frozen Adventure. For better or worse, Olaf's Frozen Adventure has become one of the most hated animated short films in recent memory: people thinking either that they were had into watching a nearly half-hour Frozen 2 trailer or suffering through nearly forty minutes of trailers, commercials and Olaf's Frozen Adventure before Coco even started. It is interesting that Olaf's Frozen Adventure, at 21 minutes long, is pretty long for an animated short. Looking back at many short films I have seen: animated, live-action, and documentary, I'd like to draw up a list of films that were shorter than Olaf's Frozen Adventure (red are animated shorts). Two short films, Henry and The Phone Call, were also 21 minutes long. The Phone Call, along with Paperman and Curfew, all won Best Live-Action/Animated Short Films. It got to where theaters put up notices announcing that Olaf's Frozen Adventure would precede Coco, a most unusual step given most audiences know an animated short is always before a Pixar feature film. I can only respond with both my feelings for Olaf's Frozen Adventure and the small audience's reaction. My impression was that the audience survived this ordeal with tolerance (I didn't see or hear anyone complain). I also thought that Olaf's Frozen Adventure was perhaps longer than it should have been here, but not a horrible nightmare to suffer through. It is the Yule Tide ('Christmas' was rarely if ever mentioned, presumably to not offend people or remind them of the religious origins of the season, which will become important later on). Queen Elsa (Idina Menzel) and Princess Anna (Kristin Bell) have invited the kingdom to join them as they Ring in the Season. As soon as Christmas is declared open...the entire Kingdom of Arendell leaves, heading off for their various 'traditions'. The sisters are disheartened to find they have no traditions to call their own. This also makes Olaf (Josh Gad), their lovable snowman, sad. If there's one thing that Olaf isn't, it's sad. As such, with the reindeer Sven, he sets out to find other families' traditions to bring to the palace. As he goes out to find out what others do on That Time of Year, he finds such things as candy canes, Santa Claus (breaking and entering OK once a year, Olaf cheerfully notes), gifts and fruitcake. He also takes a few moments to find out about the menorah and dancing with a dreidel, presumably from a Jewish family (or ones who are Jews for Jesus). Olaf excitedly rushes to bring all these traditions to Elsa and Anna, but he manages to set them on fire (and no, not from mishandling the menorah). Sven manages to communicate to Kristoff (Jonathan Groff) that Olaf is in danger, though being the himbo that he is, he doesn't get it. Anna and Elsa do, and they rush with the villagers to the dark forest to save Olaf and to reveal to him that he hasn't failed. In fact, Anna and Elsa do have a tradition. That tradition is Olaf himself: Anna sending cards of Olaf when Elsa was in her exile. Part of the problem with Olaf's Frozen Adventure is that it averages a song every five minutes. Out of those four, Kristoff's number The Ballad of Flemmingrad simply has no reason to be there. Ring in the Season introduces the plot, That Time of Year chronicles Olaf's journey, and When We're Together closes the film. As such, The Ballad of Flemmingrad really is the outlier, the musical moment that stretches the film. I understand Olaf's Frozen Adventure was originally going to be a TV special (and with commercials, it would run 30 minutes), but if Disney then decided to release it with Coco, not only should they have cut The Ballad of Flemmingrad, but they would have been wise to cut part of Olaf's bungled efforts to bring the various 'traditions' too. You might have, with cuts and snips, made this featurette into a more manageable length. The story is cute enough, though it's going to take some explaining as to why Olaf would feature Hanukkah as a Yuletide tradition when the Festival of Lights sometimes does not even fall in December, let alone close to Christmas (though in 2016, the first night of Hanukkah fell on Christmas Eve, which must have made Jewish-Christian homes especially festive). It's a positive step to feature a Jewish holiday in Olaf's Frozen Adventure, though one wonders whether the religious origins of Hanukkah (the celebration of the Jewish victory over the Greeks) are being ignored in the same way the Arendell Christmas is made to be a secular holiday. It should be noted that throughout the kingdom, in various homes, not one as far as I remember features a crèche (Nativity scene), Midnight Mass, or anything that marks the Birth of Christ as being part of a Christmas tradition. I'm not a believer in the 'war on Christmas' news cycle, but I also think too many ignore the religious aspect of Christmas in an effort to not offend the non-religious or those not of a Christian faith or background. Just as I'm not offended by a menorah at a public park, I think a Nativity scene is perfectly reasonable at a Christmas event. Olaf's Frozen Adventure has nice songs, though not ones that ring in your mind and heart, no Let It Go or Do You Want to Build a Snowman? (though bits of it are heard) or even In Summer. The story, while cute, is slight. I think the hate towards Olaf's Frozen Adventure is exaggerated, but not without some cause. As for the film, it's cute and harmless but should have been shortened.